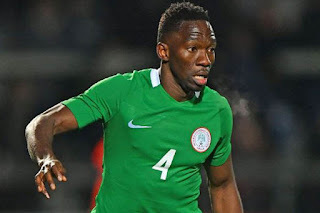 Head coach of the Super Eagles, Gernot Rohr, left out Kenneth Omeruo from the 23-man squad , that will take on Zambia in a 2018 World Cup qualifier next week, because of his slow start to the new European season. According to Complete Sports, Rohr opted for Chidozie Awaziem and Uche Agbo, because of their impressive performances for their clubs. Awaziem and Agbo have featured consistently for Nantes and Standard Liege respectively, since the new campaign began. Omeruo, is currently on loan at Kasimpasa from Chelsea. He had to wait three weeks into the new season, before the deal was completed to take him back to Turkey. The defender only made his first start (second appearance) for Kasimpasa last weekend.